A significant percentage of poker players play the game purely for recreational purposes. They almost certainly do their best to win whenever they are playing but they aren't overly concerned if they lose money in the long run. They also don't usually make it a priority to focus on improving their game, as they simply want to be able to enjoy themselves. There's absolutely nothing wrong with having this mindset. Poker can be a very enjoyable and relatively inexpensive form of entertainment, so it's perfectly reasonable to approach the game with this attitude. For many people, however, the appeal of the game is having the opportunity to win money from it consistently. It's not easy, but it's certainly achievable for anyone who is prepared to spend the necessary time and effort in order to improve their chances of winning the game. If you are a recreational poker player and interested in taking your game to the next level and if you haven't already done so, then we strongly recommend reading our guide to becoming a winning poker player. You should also take a look through this part of our website, where we look at the various resources that can help you improve your overall chances of winning the game. The most common way to make sure you are on the road to success is to study all the strategy involved in the game. This isn't something you can learn overnight but knowing even just a little bit of basic strategy will significantly improve your game. Perhaps the best way to learn about poker strategy is to read some books on the subject. There are hundreds of books that have been written by successful poker players that were willing to share their insight and knowledge, which could definitely help you improve your game. These books cover a broad spectrum of the various aspects of poker strategy and all the different formats it can be played in, so you are almost guaranteed to find something that's both interesting and beneficial. If you're a beginner, you'll find a great selection of books introducing the basics and there are plenty of options if you're looking for something more advanced too. We'll soon be adding a new section to our poker guide where we list and review a wide range of strategy books, so please keep an eye out for that. For now, here's a list of some recommended books for those relatively new to learning strategy. A good alternative, or complement, to reading strategy books is joining a poker training site. There are many of these in existence that can vary greatly when it comes to quality but most of them help you learn how to play the game in a more visual way. The basic principle of these sites is that they feature videos of expert players playing online and explaining their thought process for each decision they make. Watching these videos can be a great way to gain real insight into the way top players think, plus many training sites have other useful features offered too. Poker training sites won't necessarily work for everyone but they definitely can be effective. Many of them offer a selection of free videos you can watch before committing to a paid subscription, so you have nothing to lose by checking a few of these out. This gives you an opportunity to see if the site could help you improve your game which will help you decide if it's worth paying money for. Taking one-on-one instruction from a personal coach is likely to be more expensive than using a training site, but it can prove to be money well spent. It's something we'd generally only recommend to players who already have a background in poker education, although even beginners can benefit from it. Personal poker coaches use a variety of different methods to teach you and help you to work on your game. Some will use remote software that allows them to watch you while you play online from your computer and both offer instant advice or give you the option to go over your play at the end of the session. Other sites will review your hand histories and provide advice based on their findings. Some will even teach you a new playing style, while others will simply look to highlight any weaknesses in your game and try to fix them. Poker software can help you with your game in a variety of ways. Tracking software, for example, records all the hands you play online and makes it easier to discover any weakness in your game. It can also help you study your opponents' tendencies. Heads-up display software (HUD), which is used in conjunction with tracking software, displays information you've collected about your opponents on the screen while you are playing against them so that you can make moves accordingly. These are probably the most commonly used pieces of poker software but there are many others too. These include odds calculators, multi-tabling tools, record-keeping tools, and display customization software. At some point in the future we'll be adding a new section to the site, where we'll explain all the software and tools available in more detail. There are several poker forums on the internet, where poker players go to discuss all kinds of poker related subjects. You can glean a huge amount of information just by reading through these and you can further benefit from them if you take the time to sign up and get involved with the community. For starters, you'll have somewhere to post any concerns or questions, such as any specific strategy questions you may have and get answers from other players who may be able to help. You'll be able to get involved with strategy discussions started by others, which can help with your own game or seek advice about any weaknesses you've discovered in your game. Basically, you'll have people to talk poker with anytime you want to. If you are serious about making money from the game, you should find this very useful in the long run. The best online poker forum, in our opinion, is the 2+2 forum. We'd highly recommend checking it out, even if it's just to see what it's all about. In addition to all the books that have been written about poker strategy, there's also a great deal of strategy content available on the web. There are loads of sites dedicated entirely to the subject and also sites that cover the subject as part of a greater resource. GamblingSites.org is an excellent example of a site that has those qualities, and in our admittedly biased opinion, it's one of the very best resources for you. We have a huge poker strategy section, written and compiled by experienced players, that offers a comprehensive selection of information and advice on many different aspects of the game. 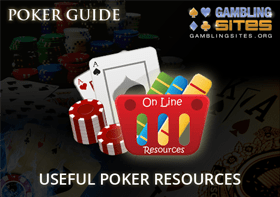 If you're looking for a free, but still valuable, poker resource, you truly won't come across a better site than our poker strategy guide.